William E. Pelham, Jr. received the 2017 Distinguished Scientific Contributions to Clinical Psychology Award last week during the American Psychological Association (APA) Annual Convention in Washington, D.C. The recognition is the highest honor from the Society of Clinical Psychology, Division 12 of the APA, and recognizes psychologists who have made distinguished contributions to psychology throughout their careers. 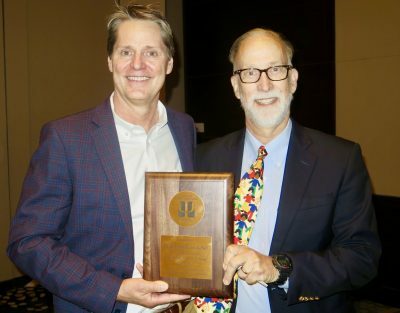 President of the Society of Clinical Psychology Michael Otto, left, and Director of FIU’s CCF William E. Pelham Jr., right, at the American Psychological Association (APA) Annual Convention. Pelham, director of FIU’s Center for Children and Families (CCF) and professor of psychology, specializes in the assessment and treatment of children with attention-deficit hyperactivity disorder (ADHD). Pelham founded CCF, an FIU Preeminent Program and a world-class clinical research center dedicated to improving the lives of children and families struggling with mental health problems. Since opening its doors in 2010, CCF has helped more than 7,000 families, and it is the largest center in Florida conducting child mental health research. Pelham also founded the nationally acclaimed Summer Treatment Program, an 8-week comprehensive summer camp program for children with ADHD and related behavioral, emotional and learning challenges. The program has helped thousands of children and has been replicated in more than 15 sites across the country, including Japan.